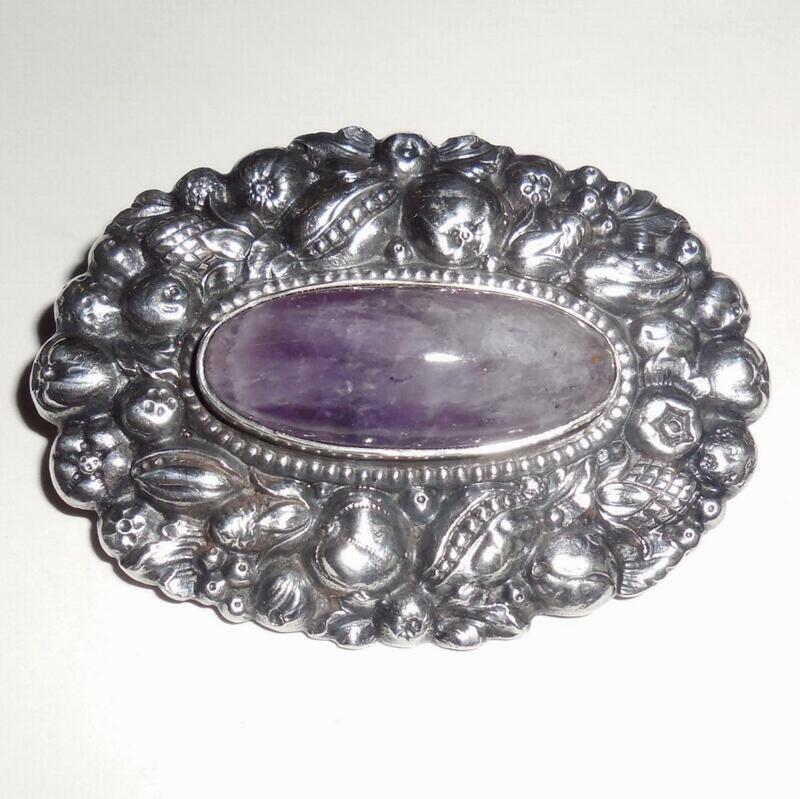 This is a large beautiful antique Victorian aesthetic repoussed fruit and nuts, 800 silver sash or chatelaine pin with a very large 30mm natural amethyst stone in original, excellent condition. 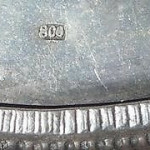 It is marked 800. 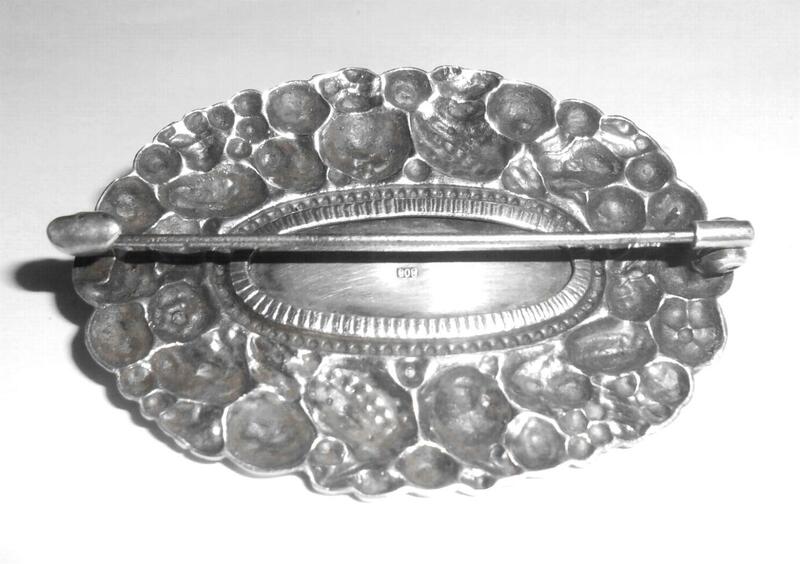 The original Victorian C-clasp is intact. Size is 1 9/16″ tall North to South by 2 1/8″ wide East to West. 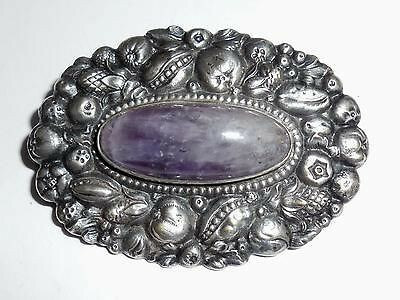 The original amethyst is gorgeous. 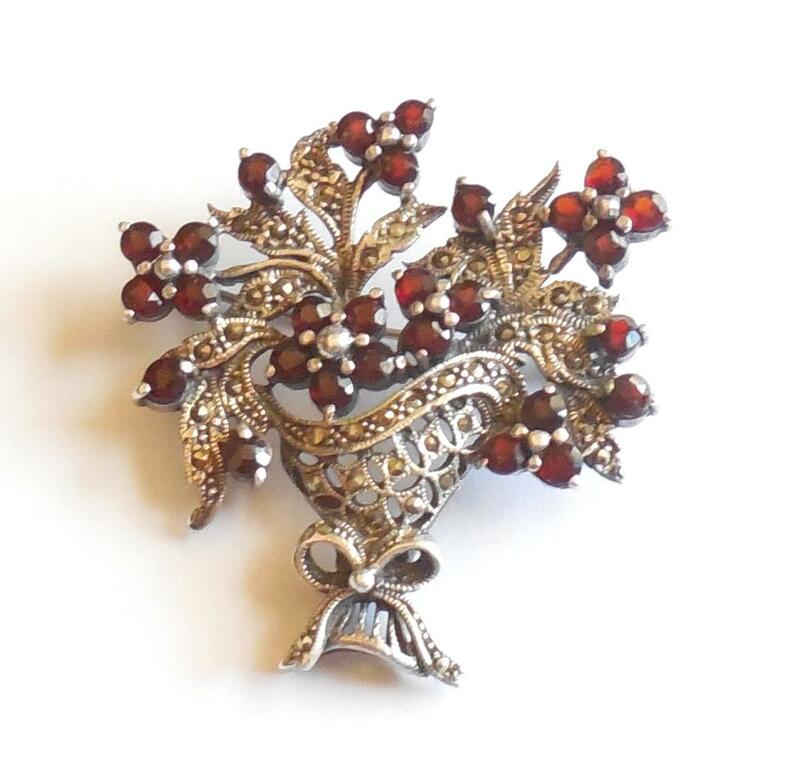 This is a stunning Victorian aesthetic movement pin for your antique jewelry collection. 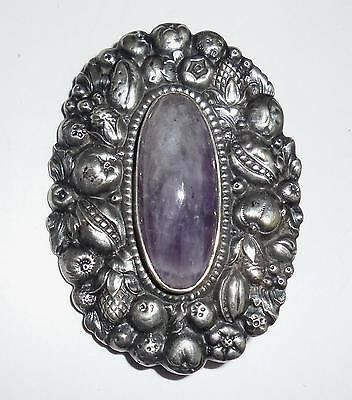 Antique Victorian Art Nouveau 800 Silver Amethyst Aesthetic Pin. 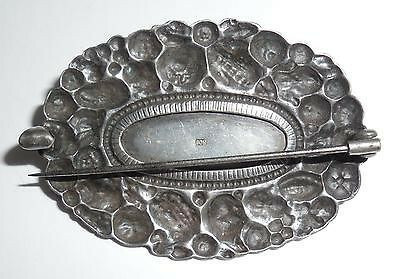 This is a gorgeous, antique Victorian to Art Nouveau, aesthetic period, fancy fruit and nuts sash, clothing or chatelaine pin. 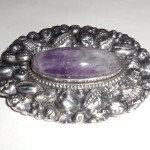 It is made of 800 European Silver with an extra large, 30m natural amethyst stone. Original, excellent condition. 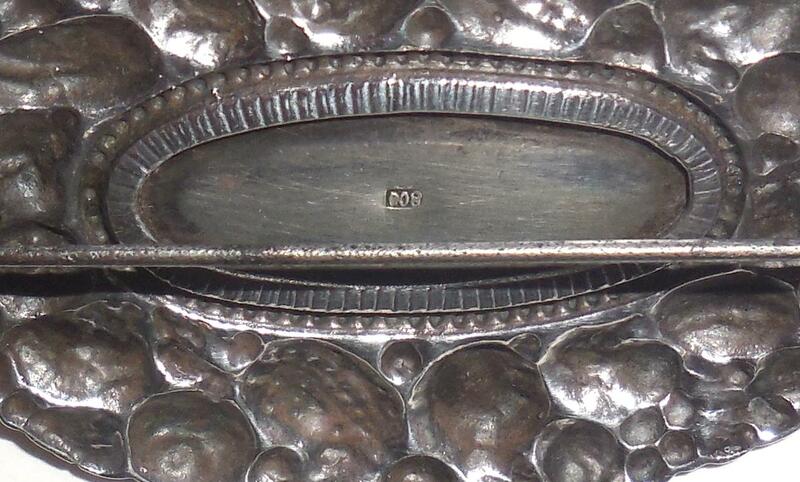 It has an old 800 punch marking and is also jeweler tested. 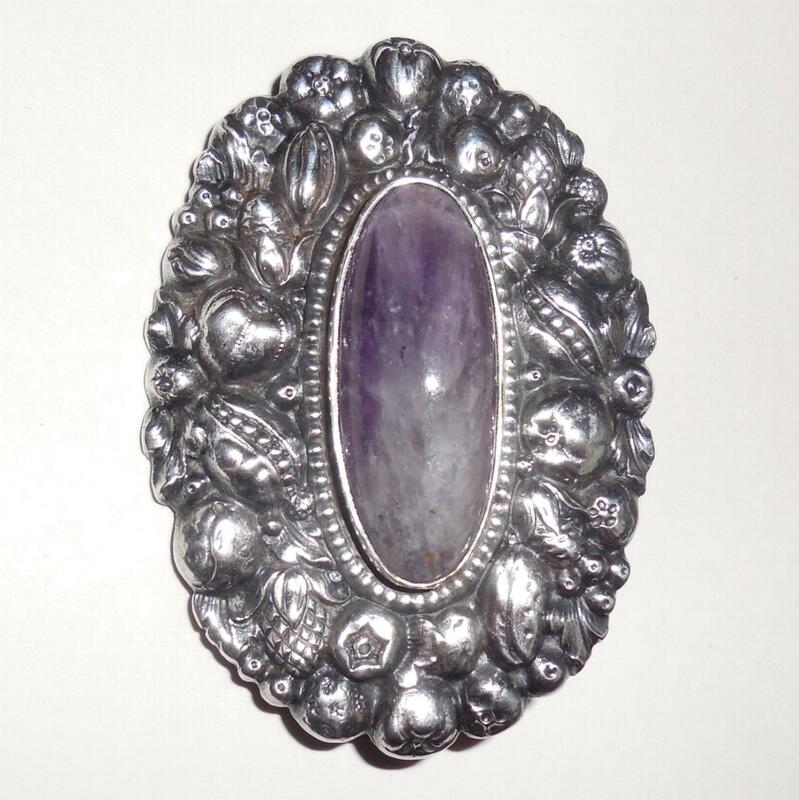 Guaranteed to be antique solid 800 silver having its original large natural mined amethyst cabochon gemstone. 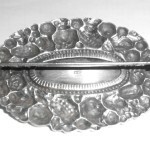 From an estate and kept in excellent condition. Very gently used. 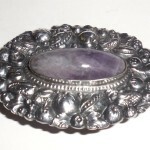 The amethyst stone is a hand cut natural amethyst crystal. 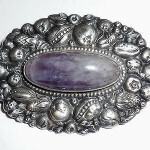 It has natural inclusions, variations and individual characteristic in the stone. There are No open cracks, chips, flakes, breaks or hairlines. Color is deep purple shading to lavender to white with beautiful color variations throughout. 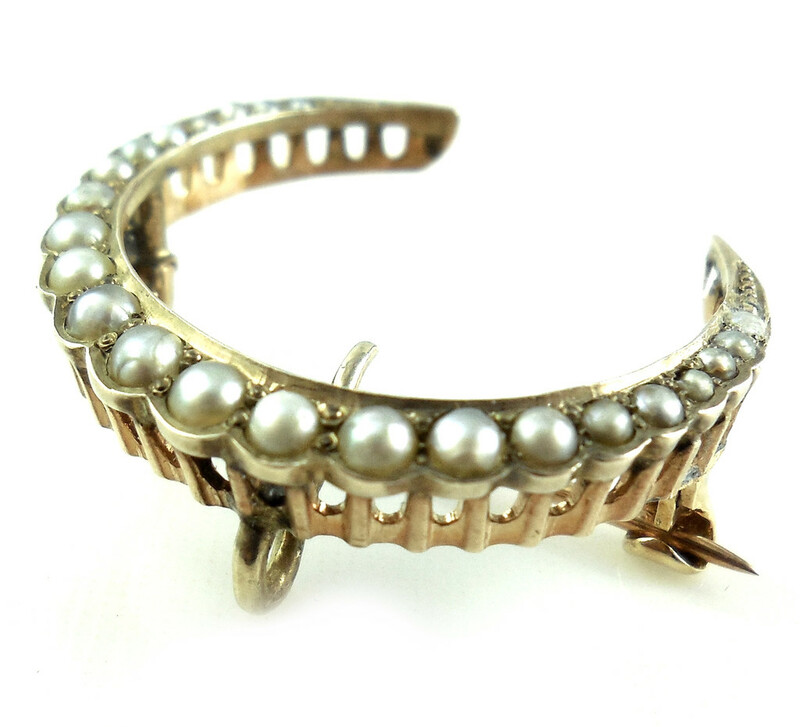 The original Victorian C-clasp is still intact and the hinge works well. Size is 1 9/16″ tall North to South by 2 1/8″ wide East to West. 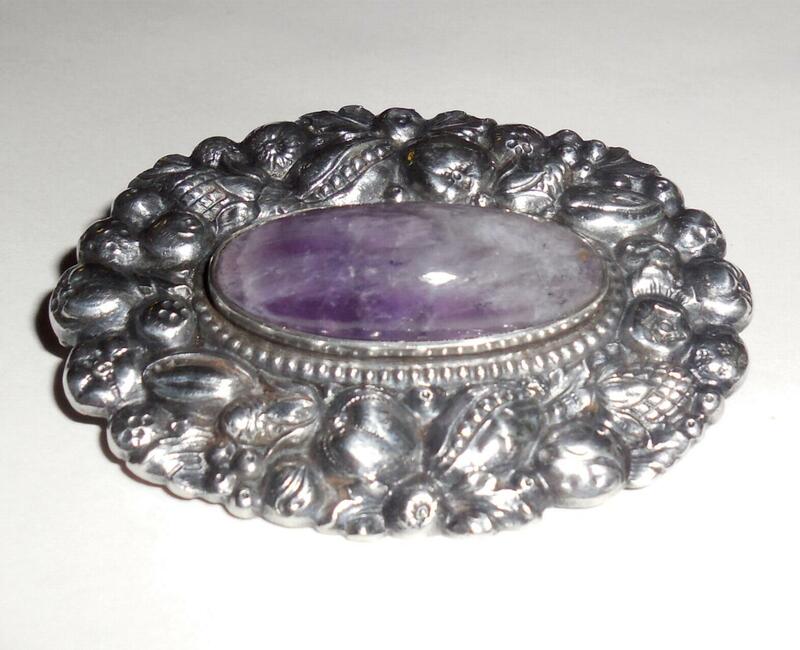 The original amethyst is absolutely gorgeous and original to this pin. Never altered in way and excellent condition. 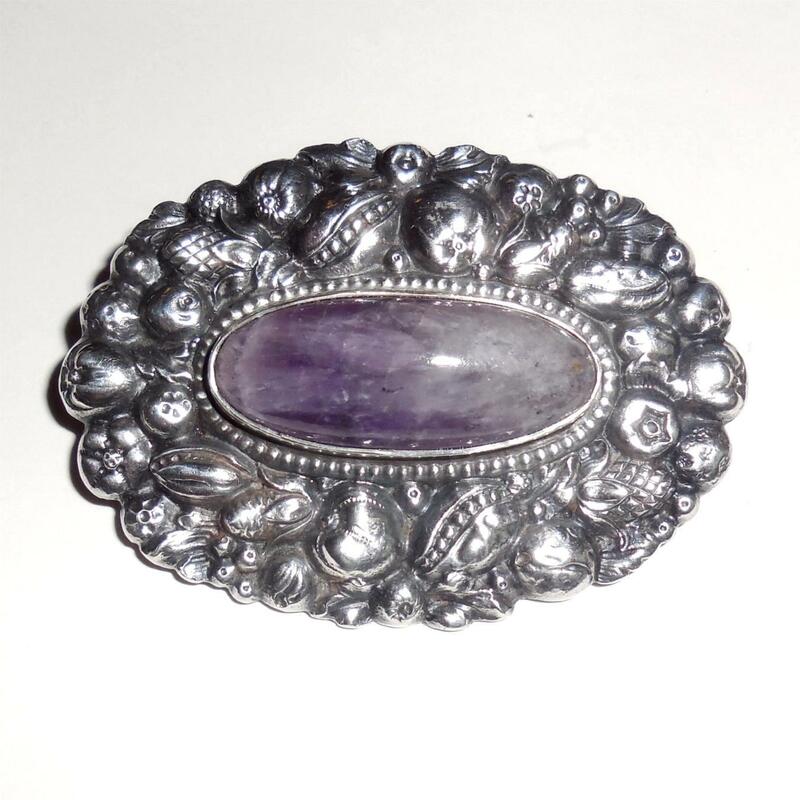 Overall, this is a stunning Antique Victorian Art Nouveau 800 Silver Amethyst Aesthetic Pin pin for your antique jewelry or clothing collection. 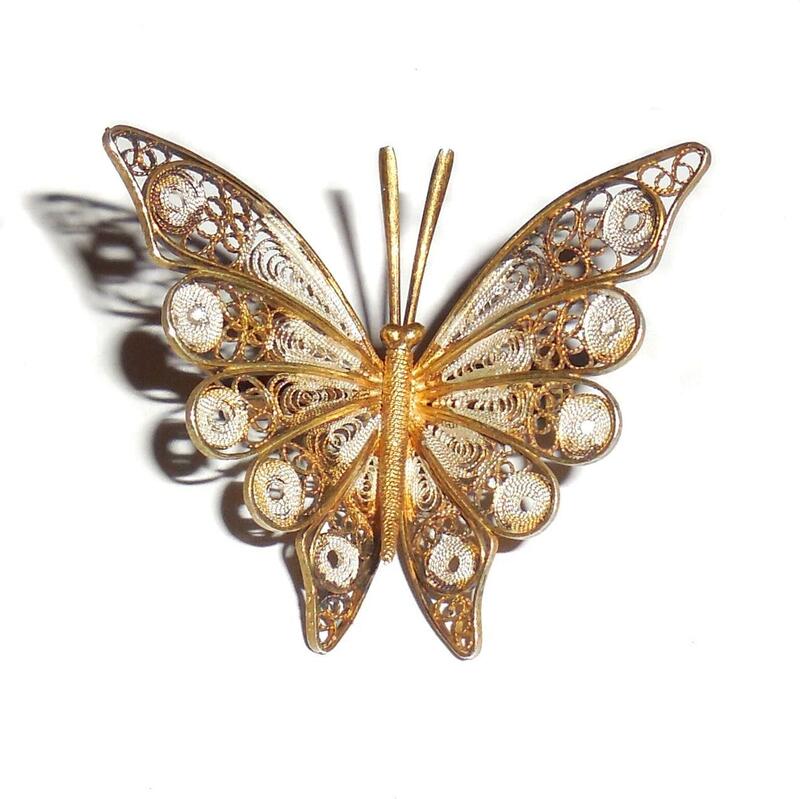 This is an antique 14K yellow gold crescent pin with its original natural cream white and silver pearls. Marked and Guaranteed to be solid 14K gold. 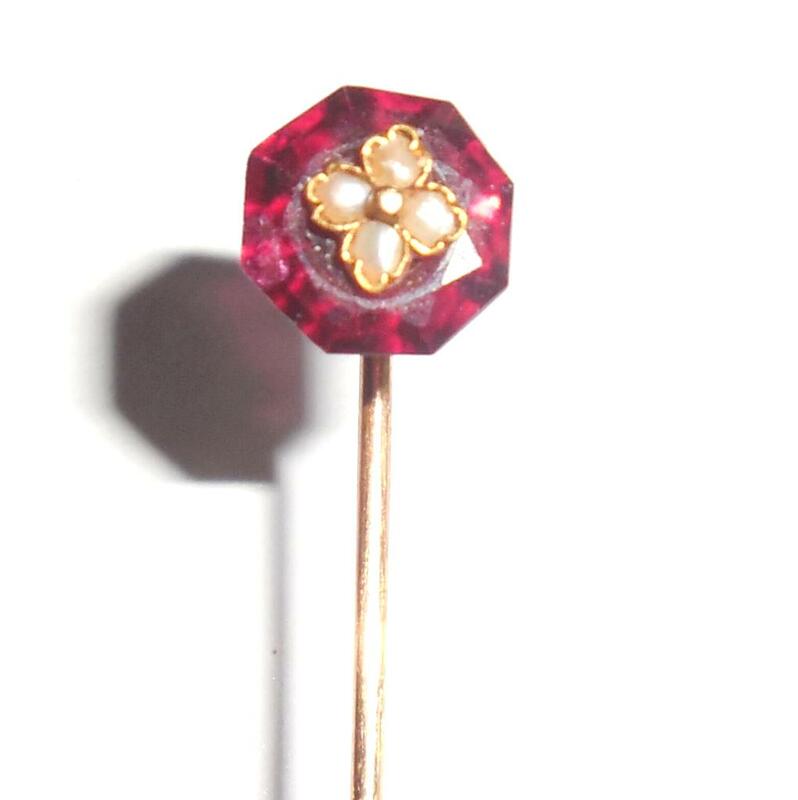 One of the tiny end pearls is worn down and should be replaced at some point. Other than this, it is in excellent condition. Size is 1" across by 7/8" tall on the longer side by 3/16" depth and 3/8" DEEP with the hook. Weight is 2.9 grams. 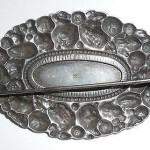 This is a gorgeous antique pin that can be used by itself or for a dangle, a watch, or any other enhancer you may have. 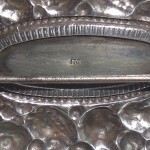 It is very strong, has good depth, is noticeable and is beautifully made by hand. 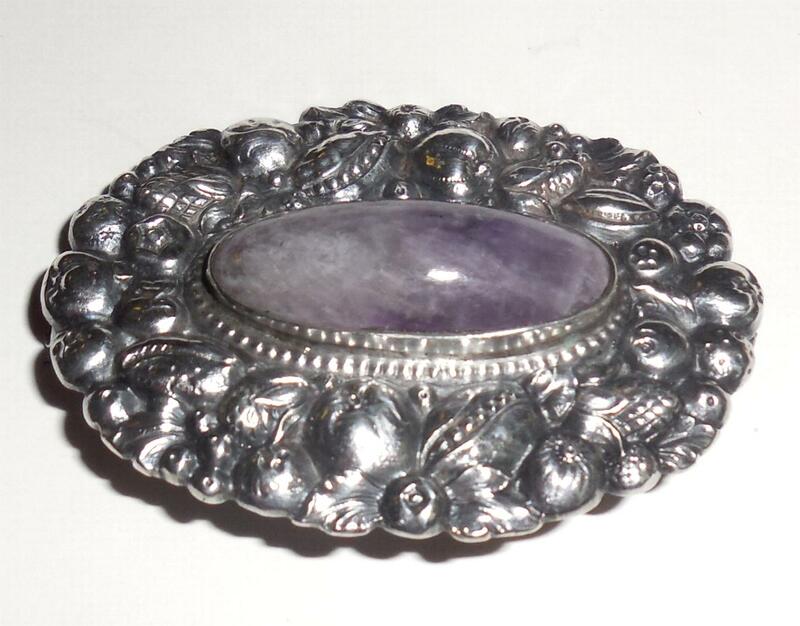 A lovely addition for your antique jewelry collection.